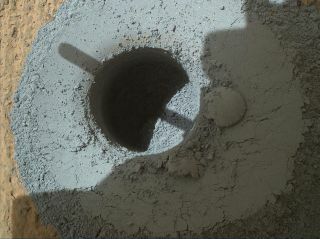 NASA's Mars rover Curiosity drilled this sample-collecting hole into a rock called Telegraph Peak on Feb. 24, 2015. NASA's Mars rover Curiosity has bored into rocks at the base of the towering Mount Sharp for the third time. The car-size Curiosity rover drilled into a rock called Telegraph Peak on Tuesday (Feb. 24), collecting sample powder for analysis by its onboard instruments. The action marked the third drilling operation at an outcrop at the base of Mount Sharp called Pahrump Hills, which Curiosity reached in September 2014 after more than a year of driving. Mission team members decided to drill Telegraph Peak after Curiosity's Alpha Particle X-ray Spectrometer instrument detected some interesting chemistry in the rock, NASA officials said. "When you graph the ratios of silica to magnesium and silica to aluminum, Telegraph Peak is toward the end of the range we've seen," Curiosity co-investigator Doug Ming, of NASA Johnson Space Center in Houston, said in a statement. "It's what you would expect if there has been some acidic leaching. We want to see what minerals are present where we found this chemistry." Curiosity — the centerpiece of NASA's $2.5 billion Mars Science Laboratory mission — touched down in August 2012 to investigate whether or not the Red Planet has ever been capable of supporting microbial life. The rover returned exciting results early on; work near its landing site revealed that the area was a habitable lake-and-stream system billions of years ago. The rover's long stay at Pahrump Hills is coming to an end. Curiosity's handlers plan to send the six-wheeled robot away from the outcrop soon, toward rock deposits higher up in Mount Sharp's foothills, NASA officials said.